Welcome to Chicago and its Interior Design Stores! Chicago has a rich tradition in home furnishings—think Crate & Barrel, Montgomery Ward, and Sears. Today you can easily find one-of-a-kind vintage pieces in neighborhood shops or choose from a highly curated selection of designs. Whatever your style, we’ve got every budget covered. Find furniture, frames, art, lighting, and more at these top 10 interior design stores in Chicago. From better-known designers to emerging brands and artists, Andersonville’s Norcross and Scott Home has a wide range. Committed to bringing fresh designs to Chicago, the shop features funky floor lamps and killer occasional chairs as well as design books, art, and tableware you didn’t know you needed. From small home decor items all the way to custom 150-year-old reclaimed wood dining room tables, Brimfield has made Andersonville its home for the last eight years. Specializing in 20th-century American furniture, custom upholstery, and vintage pieces, the store is known for its eclectic modern-meets-rustic vibe …and plenty of plaids. Traditionally known as a framing shop and card store, this Uptown establishment also offers magnets, patches, notebooks, macrame plant hangers, holiday ornaments, and other ceramic treasures. Come here for the perfect gift or that little something you need for the top of your dresser or shelf. Let your Midwest pride shine at this Lincoln Square home and lifestyle shop with a distinctly Chicago twist. Featuring the work of local, independent, and eco-friendly artists and craftspeople, Neighborly is a great spot to pick up some Field Notes notebooks or maybe a repurposed toy dinosaur turned air plant vase. As its name implies, this large north side warehouse is home to tons of salvaged architectural pieces and interesting antiques from around the world. Similar to Salvage One in West Town, Architectural Artifacts and its 80,000-square-foot showroom lends itself well to private events and is becoming a very popular wedding venue. Located in Portage Park, this Quest Modern Design specializes in mid-20th-century design in its showroom and studio. Stand-out items include Italian ceramics, Jens Risom armchairs, and brass sconces. If you love mid-century modern, you’re in luck. The business started out as just an online furniture shop and graduated to a store in North Center which sells screen-printed pillows, tea towels, locally made candles, original art, and handmade air planters. When you purchase something here you’ll know the maker and where it came from—everything is locally sourced. Located in Chicago’s Albany Park, Lincoln Antique Mall’s 7,000-square-foot showroom is stuffed to the gills with a wide selection of affordable pieces. From sleek and modern to ornate and traditional, this approachable neighborhood store is just waiting for you to discover your new favorite piece. Hunt through stacks of books, vintage framed photos, dressers piled with lamps, vintage file cabinets, and more. Unusual finds include: a retro coffee canister turned into a lamp, industrial cabinets used as bar carts, and tons of vintage trophies and suitcases. 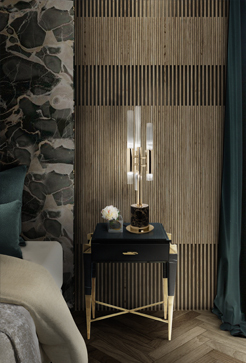 Find out all about these decoration inspirations and the best lighting designs with DelightFULL‘s latest The Ultimate Guide to Maison & Objet 2019 Ebook! Visit us also on Pinterest and do not forget to come by every day, we will have the best lighting suggestions for you and your home!